The name says it all in this Ultimate Module Challenge, bringing together a fantastic challenge and module capabilities for hundreds of obstacle designs. 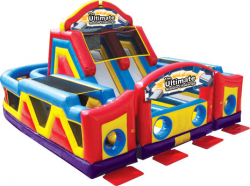 The three piece bouncy castle has a double-lane slide with tunnel exits and a pair of L-shaped obstacle alleys with pop-ups, log features, pop-outs and a rock climb and slide. Not only is this bouncy castle configurable, it also has sign banners that are customizable and interchangeable, to match your facility and bring variety to this amazing bouncy castle attraction. This Ultimate Module Challenge will draw in crowds with its bright and friendly color scheme and impressive dimensions. Client will need to provide: 3 Dedicated 15 AMP Power Outlet per blower within 75’ of Equipment Setup Location.